In advisory, Yogi Adityanath govt makes post-mortem compulsory in cases of suspicious death of cattle, warns of penalty for abandonment of cows. 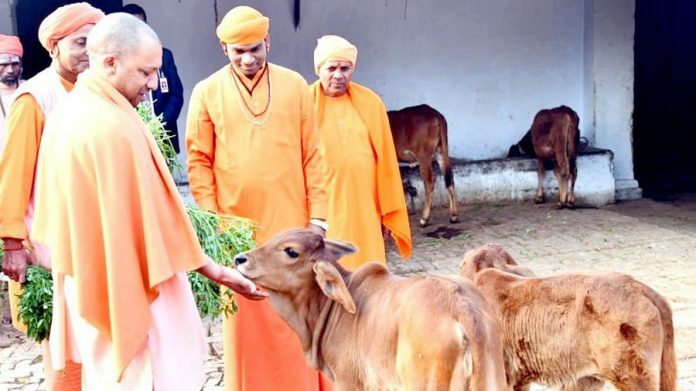 Lucknow: The Adityanath government in Uttar Pradesh has issued a comprehensive cow advisory, stating that a post-mortem is mandatory in cases of suspicious death of cattle while reiterating that there is a penalty for those who abandon their milch animals. The 23-page advisory, which also deals with cow nutrition among others, comes amid a stray cattle menace in the state that has seen irate farmers lock up the animals to prevent the destruction of crops. It follows a slew of cow-related measures that the BJP government in UP has rolled out in recent months. The advisory, dated January 28, is marked to all senior government officials in Lucknow, district magistrates and district police chiefs. It further states that within two weeks, the Urban Development and Panchayati Raj departments should draw up a plan for proper disposal of cattle carcass through incineration. Maintaining that government departments need to take care of the cremation expenses, it has called for funds to be sought from “self-help groups” and “associations involved with religious activities”. Addressing the farmer-stray cattle conflict in several parts of the state, the advisory has called for “all stray cattle at the village level to be identified”, adding that for this, “cattle would need to be tagged”. To prevent people from abandoning cattle, the government has urged officials to take action as per the UP municipal and panchayat raj laws and the Police Act. The government, in the advisory, has not only specified the timing for feeding cattle, but it also has details of nutrition. According to the government, cattle food should comprise of 10 per cent vegetables and fibre and 90 per cent fodder. “Molasses and jaggery should also be given so that govansh ko avashyak urja mile (cattle receive the necessary energy),” reads the advisory, adding that cattle “must be fed at the same time so that the animals do not fight among themselves” and wherever possible “animals belonging to the same age should be kept together in small groups”. For identifying land for cow shelters, land owned by different government departments, cooperative societies and other government-funded organisations needs to be earmarked as per law. Good move by Yogi Aditya Nath on cow management.